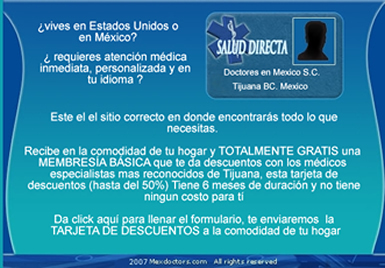 One of the many advantages of being treated in Mexico are low cost compared to prices of the United States. A DOCTORES EN MÉXICO S.C. The support are the most recognized specialists in the region, its technological support and members of its Board. Specialist,medical specialists: Allergy, Anesthesiology, Circulation Specialist , Audiologist, Cardiology, Surgeons, Plastic & reconstructive Surgery , Dermatology, Endocrinology Specialist , Fertility, Phlebotomist, Gastroenterologist, Geriatrics, Gynecologist, Hematologist, Homeopathy, Inoculation & Immunizations, General Practice ,Internal medicine, Kidney specialist, Respiratory diseases, Neurology & neurosurgeons, Nutrition, Ophtalmology, Oncology, Ortopedics, Otorhinolaryngology, Patology, Pediatricians, Podiatrists,Psichologist, Psichiatrics, Proctology, Chiropractics, Radiology, Rehabilitation, Tratamiento del Dolor, Trauma specialist, Urology, Veterinarians Zootecnology etc.